A break from weather reports, a break from my normal sunny talk. I think quite a few people read this blog. Please read the following page carefully. Holidays. Beaches. Sunshine. Warm waters... we are now into the low season in Phuket, often the weather will be fine and the sea will look inviting, indeed some days can be as good as any day in the high season with the added bonus of less crowds and low hotel rates. BUT, and this is a big BUT, there is one problem with the low season, despite the sunshine you have to realise that the prevailing winds blow onto the west coast of Phuket from the west. And the main beaches all face west. Thus, you can get waves. Sometimes quite big waves. This can make conditions unsafe for swimming. 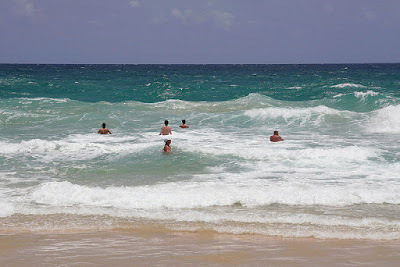 Every year, people drown off the beaches in Phuket, and not just 1 or 2 people. We are looking at 30 or more. Now, some of these may be due to natural causes like heart attack. Some because people who cannot swim very well get into trouble.. and this can happen anywhere. BUT some victims are young and healthy, like a British girl age 21 who drowned this week at Karon Beach. Or a 21 year old guy who drowned in June last year. We already had a drowning victim in May - first of this season. And there are not enough, or even ANY properly trained lifeguards at all the beaches. There was apparently a new system set up recently - but Phuket's west coast is beach, beach, beach. Karon alone is over 3km long - I am not sure it's possible to watch all the people all the time. So, please if you are reading this - look for red flags. 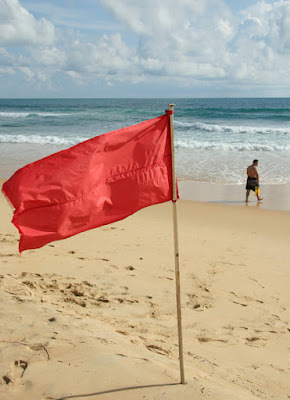 I realise the flags are there all low season, and on some days the sea might look nice and calm, but please please be aware that in low season you can get some nasty currents at some beaches - Karon and Surin tend to be worst - RIP currents - a rather ominous name. I was caught in a rip one time off the west coast of Africa. It was scary. I was young and very fit, got carried out with another person while a friend who was swimming just meters away got carried back inshore by a wave. Rip currents can be very localised. It can be a matter of meters. You might be fine, but watch someone else being taken out to sea. In my case, I knew what to do - relax, then swim parallel to the shore away from the rip, and swim back in. By the time I hit the beach I was very tired. I needed a cigarette even though I was a non smoker! 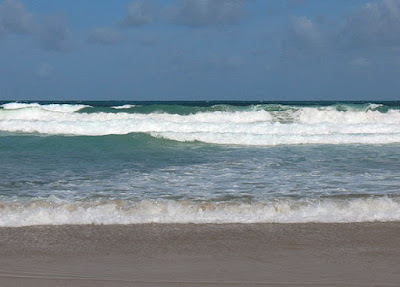 You can find plenty of information on rip currents on the net - do a Google search, or start with this article by a guy called Tezza who is a regular visitor to Thailand - "Some Tips on Not Drowning". Worth a read. (above) I took this picture end of April last year at Karon Beach. I'd not do that myself. Each to their own. 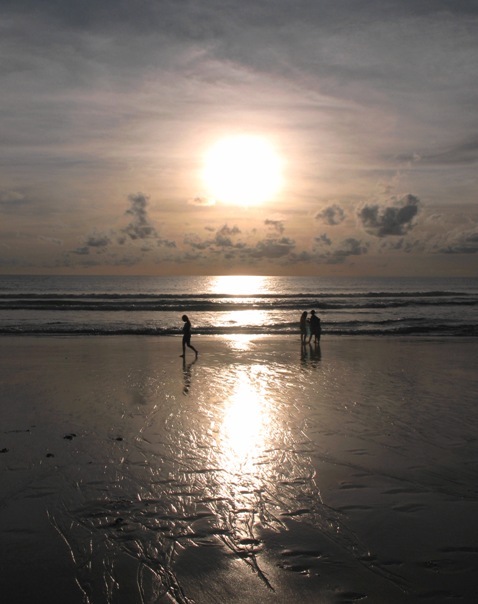 The photo below is also at Karon Beach in the low season (photo is from July 2008). You get plenty of days like this, nice weather, pretty calm seas. It can lull people into a false sense of security. Personally, I like low season, less crowded, less busy at work (! ), cooler days, a bit of rain and variety in the weather, and the days are longer - sunset in July is 45 minutes later than December. I like the longer sunny evenings. I do recommend a Phuket trip at this time of year. BUT, here's that big BUT of mine again - watch the waves. Please don't drown.